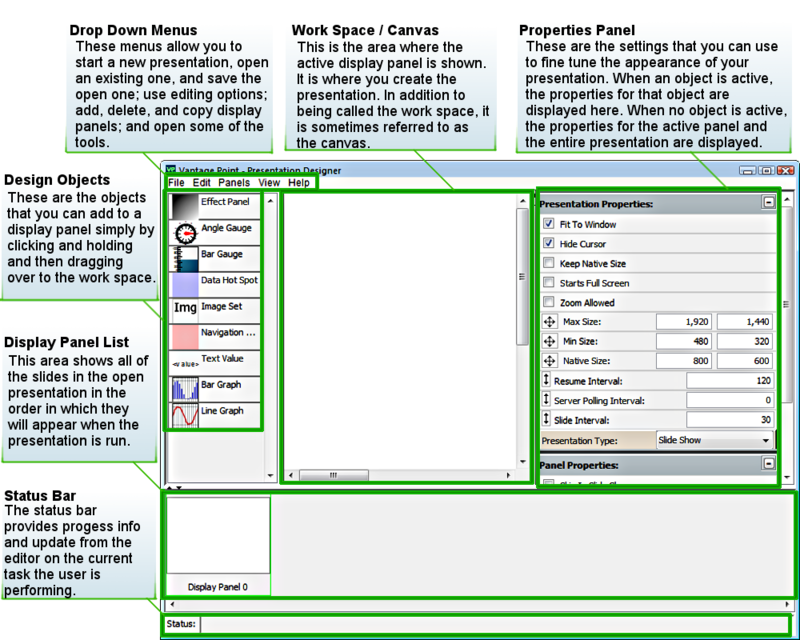 These menus allow you to start a new presentation, open an existing one, and save the open one; use editing options; add, delete, and copy display panels; and open some of the tools. These are the objects that you can add to a display panel simply by clicking and holding and then dragging over to the work space. For detailed information about each object, go to the Design Objects chapter. This is the area where the active display panel is shown. It is where you create the presentation. In addition to being called the work space, it is sometimes referred to as the canvas. These are the settings that you can use to fine tune the appearance of your presentation. When an object is active, the properties for that object are displayed here. When no object is active, the properties for the active panel and the entire presentation are displayed. For detailed information about the properties of each object, go to the Design Objects chapter. This area shows all of the slides in the open presentation in the order in which they will appear when the presentation is run. The status bar provides progess info and update from the editor on the current task the user is performing.